When should you use hazard warning lights? When should you use hazard warning lights? When can you use hazard warning lights? Our hazard warnings lights are our indicators flashing in unison. They are used to warn other drivers. They are usually activated by pushing a button with a red triangle on that will be located most frequently in the middle of the dashboard. When they are activated you will see both indicator lights flash on the dashboard in unison and you will hear some kind of auditory feedback in time with the flashing. The Highway Code is very specific about their use (read below), but they’re often used by motorist in situations which are not in the Highway Code, for example, when parking in an illegal place such as on a pavement. The intention might be by the driver to let a traffic warden know that the vehicle is parked there temporarily (e.g. just a few minutes), however, the vehicle is still parked illegally and may be ticketed or towed regardless. One use of hazard warning lights which is allowed briefly is if you have to stop abruptly on a motorway or unrestricted dual carriageway for an obstacle, but there is not a vehicle immediately behind you. You can use your hazard warning lights to warn any vehicles approaching from behind that you are stationary. This is more important in low visibility conditions, and at night when distance is harder to judge. We’re not sure why the Department for Transport is specific about this only being a motorway or unrestricted dual carriageway when it also might make sense on a darker single carriageway rural road. When must you not use your hazard warning lights? When your hazard warning lights are activated it can cause some problems in the perception by other drivers of where you want to go. For example, if a driver can only see your left-side indicator it will look to that driver like you are indicating left, and vice versa. This can be more confusing for drivers if you are parked in a row of vehicles with your hazard warning lights on as they will only see your right-hand indicators and it will look like you mean to pull out of the row of parked vehicles. Your indicators will not function when your hazard warning lights are activated, therefore this makes it difficult for other drivers to see your intended direction. Some countries recommend using hazard warning lights in bad weather or while driving slowly. This is not permitted in the UK. A driver might think it is OK to use the hazard warning lights when driving slowly looking for a building or street sign, but this simply renders any use of the indicators ineffective. The way to do this is to indicate left and stay left. If you miss your turning on the right then you can perform a u-turn when it’s safe to. 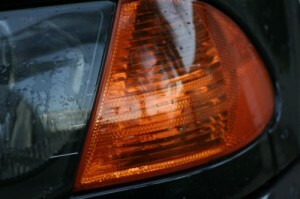 If both one indicator bulb is blown, your hazard warning lights will look like you are indicating. There’s no specific fine for not using your hazard warning lights correctly, although the circumstances in which you are using them might give cause for another type of penalty or fine, e.g. you are double-parked. Do you know the road rules regarding incidents, accidents and emergencies? Most people don’t. See how many you get right in our quick 10-question quiz.